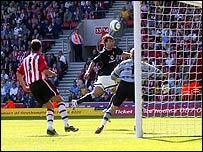 A Southampton fan saw his side get relegated twice - after dreaming about the goal that sent them down. Peter Webb watched helplessly from the stands as Ruud van Nistelrooy scored for Manchester United in the 63rd minute - just as he had forecast. The 37-year-old financial expert made a pretty packet from the goal after putting on a bet at 500/1 - but would much rather have seen the Saints stay up. Webb told BBC Sport: "I had the dream a few weeks ago and posted a message about it on the Betfair betting site. "It eventually dropped off the list so I re-posted it last Friday to let everybody know I was going to the match." The message, under the pseudonym of 'Scripophilist', read: I dreamt I was watching Southampton vs Man Utd and van Nistelrooy scored in the 63rd minute to send Southampton down. No chance I thought as I don't even have a ticket. Anyhow I get a phone call earlier in the week from an old friend who offers me his ticket. Spooky. I can remember exactly in this dream where I can see the goal going in. So when I turn up on Sunday I will check my position in the stadium and if I am sat in the same place it's straight to the bookies to place a bet! Webb admitted: "I was in two minds whether to go - especially as I was sitting exactly where I dreamt I would be - but I guessed it could be an historic day. "I wanted to help Southampton in their hour of need but maybe I did the opposite! "When the clock turned into the 63rd minute everything went in slow motion and I had to look away in the hope that it wouldn't happen. "But I turned back in time to see Alan Smith cross for van Nistelrooy to head into the back of the net. "When the goal went in I thought I was going to get lynched by the people next to me or burnt on the cross or something. "It was agony. A very, very strange feeling - the most incredible sense of deja vu. For a moment I wondered whether I was asleep and having the same dream again." 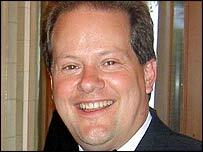 Webb did not reveal which bookmakers he had the bet with, but they will be running scared if he has any more visions. William Hill spokesman Graham Sharpe said: "I'm glad he didn't wake up in time to have the bet with us! ", while Dan French at Ladbrokes added: "Bookies don't believe in deja vu and we certainly don't believe in lightning striking twice. "If he does it again, we'll be going 'Back To The Future' and digging out his Sports Almanac!"